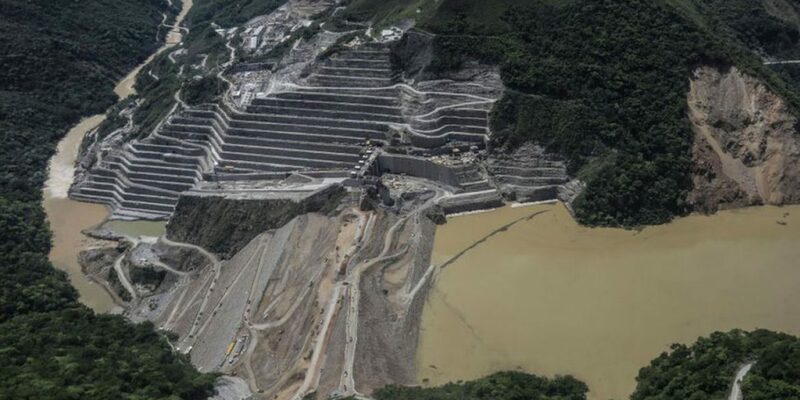 Communities living below Colombia’s largest dam project have been warned that heavy rainfall during the ongoing rainy season increases the risk of a Hidroituango dam wall collapse. The town of Puerto Valdivia remains on red altert; Puerto Antioquia and Caceres are on orange alert; Caucasia and Nechi are on yellow alert, regional disaster management agencies reiterated on Thursday. Juliana Palacio Bermudez, director of DAPARD, the disaster prevention and recovery agency of the Antioquia province, said they are extending the alerts because Medellin energy company EPM has yet to regained control over the project. The increased water flow from the rains will also increase stress on the dam, April is the month that typically brings the heaviest rains. Hidroituango would dam a maximum volume of water of 2.72 billion cubic meters, in addition to millions of cubic meters of sediments (a figure that cannot be found in public studies). The structure of the dam adds 20 million cubic meters of solids, so there is a large volume of water and sediments, as well as organic load, much of it not removed prior to filling. Puerto Valdivia experienced massive flooding in Mid-march due to technical mismanagement of the dam. The town has been on red alert since May last year. The dam was set to supply 17% of Colombia’s energy and has been a pet project of Antioquia’s political elite since 1969. The dam now may never even produce energy. Earlier this year EPM was forced to flood the machine room of the dam in order to prevent a collapse, which would have created a disaster of unprecedented proportions and flooded 12 municipalities and put the lives of more than 100,000 in danger. Hidroituango is a project that constitutes a time bomb that threatens hundreds of thousands of people and that entails such a rosary of failures and problems without nature having tested it with the occurrence of an earthquake (initial studies show an earthquake of magnitude 5.6 near the project site according to the preliminary study of seismic risk Ituango Project, prepared by Woodward-Clyde), or extreme storms, that the work must be dismantled, although that decision also carries great risks. The technical problems with the dam are likely due to rushed construction and changes to the design that were not approved by regulatory agencies. Rios Vivos, an Antioquia-based organization that has represented affected river communities, has long denounced the damage caused by the dam. The NGO has asked EPM to immediately make all information related to the dam’s viability public and to have independent experts do physical verification. Rios Vivos has denounced the psychological effects on communities who have been on alert for an extended period of time, wondering whether their communities will be swept away by floods. At least three of the NGO’s leaders have been assassinated over the past three years.